From charting energy networks to revealing new and emerging lands, measuring human migration to assessing the planet’s ant populations – and including the phenomena we have little control over such as lightning strikes or asteroid impact – each map asks you to question, wonder and look again at our rapidly changing and often surprising world. 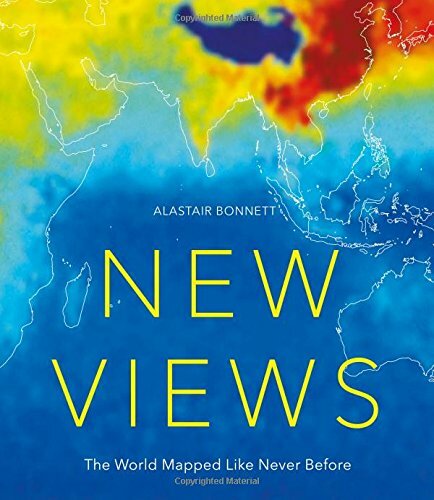 Divided into three thematic sections: Land, Air and Sea; Human and Animal, and Globalisation, New Views offers a fresh and truly global portrait of our intricately fascinating planet. I was very impressed with this book and so was my 14 year old granddaughter. In fact she asked if she could please take the book to school with her on Monday. The book offers meaningful topics that are of concern. We were amazing at the topics and the facts. This is a excellent book for all ages. I plan to keep the book as a coffee table book. It is a great conversation starter. This is definitely a great gift for the holidays for anyone on your holiday list.